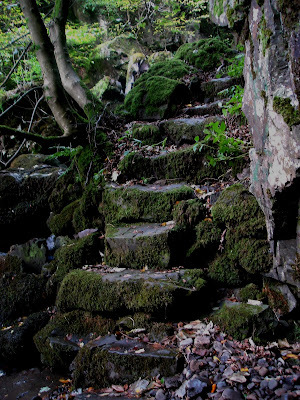 A bit of muddy scrambling gets you to these rather Tolkeinesque steps, leading up to the plunge pool of a small waterfall. This is the waterfall that steepens the path. And above the plunge pool the path became a little steeper and a bit of a scramble, not exactly paved! Above the fall the valley opens out and the path climbs to cross the main road and up the edge of the hill to Crichton's Cairn.